The proportion of self-employed workers saving into a personal pension scheme has fallen by 65 per cent in the last decade, according to a new report published by the Resolution Foundation. In 2012-13, just over one in four (27 per cent) self-employed workers had a non-frozen personal pension, compared to half (51 per cent) of employees. One in five (19 per cent) self-employed women had a non-frozen pension. The number of self-employed individuals contributing to a pension scheme fell from 1.1 million in 2001-02 to 0.5 million in 2012-13. With the self-employed workforce growing by 900,000 over the same period the proportion of those contributing has fallen by almost two-thirds (65%). The Resolution Foundation says that this alarming drop is mainly due to newly self-employed workers not saving and existing workers stopping their contributions. Both of these trends have been accelerated by the crash and subsequent pay squeeze. A return to real earnings growth may encourage some of these workers to start saving again, while those moving into an employee job are likely to be auto-enrolled into a workplace pension scheme. However, the Foundation notes that pension saving among the self-employed started to fall away before the crash, so rising earnings will not guarantee extra pension contributions. And with self-employment becoming a longer-term career choice for many people more needs to be done to get them saving for their retirement. The briefing explores other possible reasons for this lack of saving and finds that self-employed workers are more likely than employees to have non-pension income to draw upon in retirement. They are more likely to prefer other forms of savings, such as ISAs, and some of those with employees expect income from their company, or the sale of it, to form the largest part of their retirement income. However, these extra forms of income are unlikely to be enough to compensate for the shortfall in pension saving. The main barriers to pension saving for self-employed workers are low earnings and not being able to afford to contribute. Around two in five (41 per cent) self-employed workers without employees – who account for the vast majority of the self-employed workforce – say that they can’t afford to save for a pension, a far higher proportion than employees (33 per cent) and self-employed workers with employees (28 per cent). However, the fact that self-employed workers earning the same amount as employees – between £20,000 and £25,000 – are more likely to say they can’t afford to save (30 per cent, compared to 23 per cent) suggests that the lack of pension saving is not simply down to low pay. This lack of pension saving means that self-employed workers without employees say they are as likely to rely on the state pension for their main income in retirement as an occupational or personal pension. In contrast, employees are more than twice as likely to rely on an occupational or personal pension as the state pension. And while the self-employed are among the main beneficiaries of the new flat rate state pension, with a current annual value of around £8,000 it may not provide enough for a comfortable retirement as someone’s main source of income. Falling pension saving has been an issue throughout the workforce in recent decades, though auto-enrolment has started to reverse this trend for employees. The Resolution Foundation is concerned that because most self-employed workers are excluded from auto-enrolment they could continue to face poor retirement incomes. “Self-employment grew sharply during the downturn, and has only edged down slightly in recent months. As self-employment becomes a longer-term career choice for millions of people, it’s important to better understand not just current earnings, but incomes in later life too. 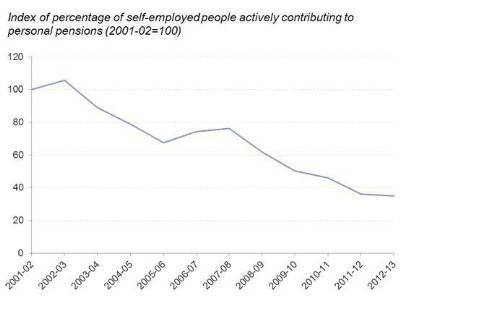 “Pension saving among the self-employed has dropped sharply over the last decade. The recent economic recovery may start to reverse some of this fall, and the new flat-rate pension will provide a boost, but for many of the self-employed, the overall outlook for their retirement income is worrying. “While some self-employed workers will have other forms of income to rely upon, pensions are still the main way to boost living standards in retirement and more needs to be done to encourage this kind of saving.